Tarakan is a small island and relatively close to Tawau (Sabah, Malaysia). Located east of East Kalimantan, the island is a stepping stone to other places. The island is no doubt a popular transit for International trading between Indonesia and Malaysia making it a perfect spot to buy certain Malaysian goods such as snacks and dairy products. While in Tarakan, be sure to visit the Mangrove Forest Conservation Area in the city centre. 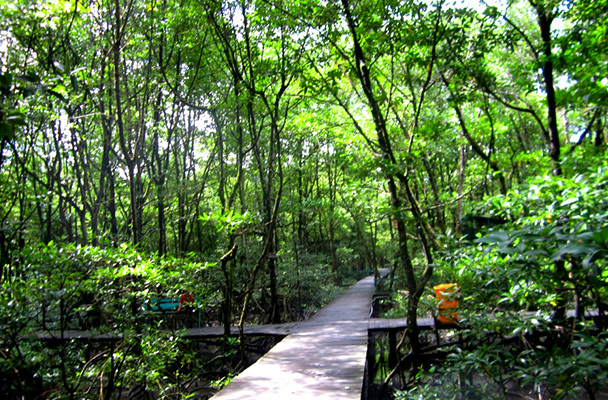 The 22 hectares mangrove forest is home to proboscis and macaque monkeys as well as many bird species. It is also noted for 'ikan tempankul' (mudskipper). Just three hours away by boat, is Derawan Islands that comprise many breathtaking islands including Derawan, Sangalaki, Kakaban, Maratua. The close proximity to these islands also makes Tarakan a promising gateway to diving and snorkeling paradise where manta ray sightings are guaranteed and visitors can swim along with thousands of non-stinging jellyfish. Tarakan has an airport called Juwata Airport. The airport has domestic flight routes to Balikpapan, Jakarta, Surabaya, Denpasar and Makassar, as well as an international route to Tawau.